Zhao, J., Glueck, M., Breslav, S., Chevalier, F., & Khan, A. (2017). Annotation graphs: a graph-based visualization for meta-analysis of data based on user-authored annotations. IEEE transactions on visualization and computer graphics, 23(1), 261-270. User-authored annotations of data can support analysts in the activity of hypothesis generation and sensemaking, where it is not only critical to document key observations, but also to communicate insights between analysts. We present annotation graphs, a dynamic graph visualization that enables meta-analysis of data based on user-authored annotations. The annotation graph topology encodes annotation semantics, which describe the content of and relations between data selections, comments, and tags. We present a mixed-initiative approach to graph layout that integrates an analyst’s manual manipulations with an automatic method based on similarity inferred from the annotation semantics. Various visual graph layout styles reveal different perspectives on the annotation semantics. 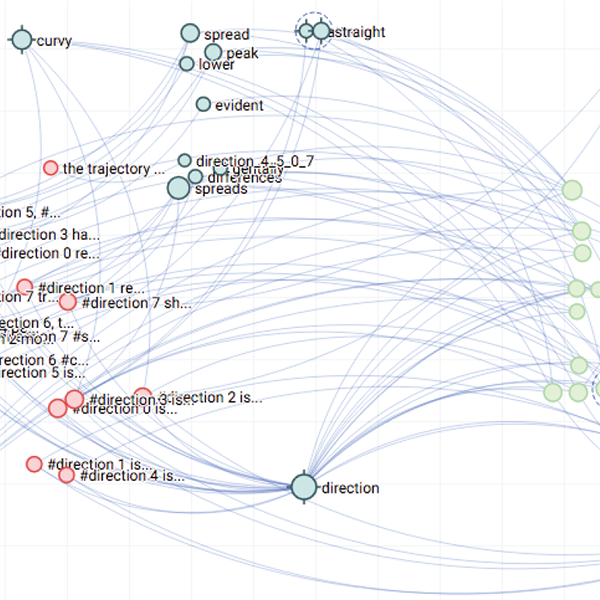 Annotation graphs are implemented within C8, a system that supports authoring annotations during exploratory analysis of a dataset. We apply principles of Exploratory Sequential Data Analysis (ESDA) in designing C8, and further link these to an existing task typology in the visualization literature. We develop and evaluate the system through an iterative user-centered design process with three experts, situated in the domain of analyzing HCI experiment data. The results suggest that annotation graphs are effective as a method of visually extending user-authored annotations to data meta-analysis for discovery and organization of ideas.